As an ASP.NET developer, you probably often hear about "jQuery" term. Although jQuery is not strictly part of ASP.NET, it is very popular among ASP.NET developers and used in many ASP.NET web sites. First advantage of jQuery is that it simplifies common tasks. If some feature is already created, working well and is tested on many websites, then there is no reason to create it again from scratch. - client side validation of user's input etc. jQuery architecture is extensible. There are many plug-ins ready for use in different scenarios. For example, if you need to create some element of user interface, there is a good chance that someone else also needed the same thing before. You just need to search plug-in directory and check if there is a widget which does exactly what you need. To use jQuery, you need to add a reference to its core .js file. Currently, last version is 1.5.2., and jquery-1.5.2.min.js file, minified and gzipped has 29KB. That is definitely negligible. In addition to this, if you use jQuery UI or plug-ins, you need to reference plug-in .js files too. If you overdo in creating of some extremely "rich" user interface with too many widgets, effects and other features, then it's possible that page could download slowly because of dozens of external .js files. Most known alternatives to jQuery are YUI (Yahoo User Interface) library, Prototype, script.aculo.us, MooTools, Qooxdoo, MochiKit, Midori, Dojo, Ext JS etc. If you have Visual Studio 2010 installed (including Web Developer Express version), it already includes jQuery in web project templates. You can go File -> New Project -> ASP.NET Web Application or ASP.NET MVC web Application, or File -> New Web Site -> ASP.NET Web Site. In each case newly created project contains folder named /scripts where jQuery files are located. To create new web application or web site without jQuery, choose ASP.NET Empty Web Application or ASP.NET Empty Web Site. Of course, you can also add these .js files manually. Newest version and all previous versions of jQuery library could be downloaded from http://docs.jquery.com/Downloading_jQuery#Download_jQuery. After you created new ASP.NET project with included jQuery 1.4.1. version, or placed newest jQuery version manually, you can use jQuery in ASP.NET page. 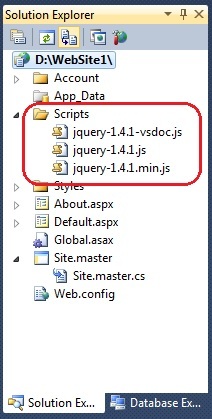 So, in this example, we look into Scripts folder where jquery-1.4.1.js file should be located. This is suggested location by Visual Studio project template. jQuery .js file could be located on other location if you want, even on other web server. Very often, developers point to Google or Microsoft's server instead of local folder. The benefit of external reference is decreasing of bandwith costs. Also, since jQuery is extremely popular, there is significant chance that your visitor already has jQuery .js file cached on local computer. In this case, there is no need to download same .js again. On this way, using Google or Microsoft's servers speed up your page load and increases user's experience. When developer learns new technology, first example is traditionally "Hello World" application. 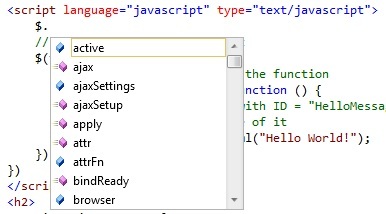 So, let see how we could create Hello World in jQuery. Click on button to execute jQuery method! If you start application and click on button, Hello World! message will appear inside of div tag. In addition to this, some jQuery objects could contain one or more sub-objects divided by dots, but syntax stays the same. There could be many sub-objects, but all are separated by a dot, which is familiar syntax to developers in other programming languages like C# orVB.NET. jQuery core library can be extended, to provide abstraction over core functionality. jQuery UI library contains over 30 components, like Datepicker, Tabs, Slider, different effects, elements for interaction with user etc. In addition to this, you can create your own jQuery plugin to get feature you want. jQuery community is very active and there are thousands of plugins published on http://plugins.jquery.com , which are sorted in several categories, like Ajax, Animation and Effects, Browser Tweaks, DOM, Data etc. It is good idea to look into this directory first, and possibly avoid creating of something from scratch. jQuery syntax is simple in general. jQuery motto "write less, do more" sounds very appealing. However, notice that "write less" doesn't mean "write fast". Although you can do a lot with single line of jQuery code, it is not always easy to write the line directly from head. jQuery objects, especially if you work with plug-ins, could have numerous parameters and for many people is difficult to remember them. So, while you work in jQuery, you will probably often have to look into documentation to see which parameters certain object requires. There are security issues related to using of jQuery with ASP.NET. Since jQuery executes on client side it can be easily manipulated by malicious user. Any information that comes from jQuery to ASP.NET server side code, through AJAX or on any other way, should be treated as potentially dangerous user's input. I hope that jQuery looks a little friendlier to you after reading of this article :). More about jQuery you can find on its official website, www.jquery.com.